I was shopping for a new bike for my 7 year old daughter this past weekend. She’s at an age now where she’s ready for a “serious” bike. She’s ready to take on longer rides and more challenging terrain. So we paid a visit to the specialty bike shop in our hometown. This is the same shop my parents bought my first bike from when I was her age. This store is known to be expensive. They sell high quality bikes… not the kind you’ll find in a big box department or sporting goods store. A couple years ago, when I was shopping for my own bike, I wouldn’t dare set foot in this store because it was too expensive. But this time, I knew I wanted to buy my daughter’s first bike from this store. We did walk out of that store with a new bike. The whole experience highlighted 3 critical lessons about sales. 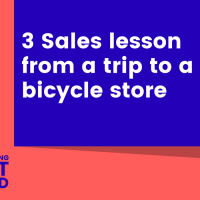 Whether your selling bikes, consulting, services, software, or anything else — these 3 lessons will help you make more sales.